The handspinning of flax gives me great satisfaction. Giving me even more satisfaction is using the handspun thread as the weft in handwoven kitchen towels. The resulting fabric has a rustic look and a substantial hand. Over time the linen thread lightens in color. and with subsequent numerous washings the thread becomes somewhat thinner. I am buying flax for handspinning now from three interesting sources. One is Taproot fiber Lab in Nova Scotia. Patricia Bishop and her colleagues growing flax, retting it in the field, and preparing it in their workshop. One may dye their dark flax and spin it up. Imagine flax grown in Nova Scotia! I have had good luck spinning it, and weaving with it. The dark color washes quickly away. Another source is Black Cat Farmstead in Wisconsin. 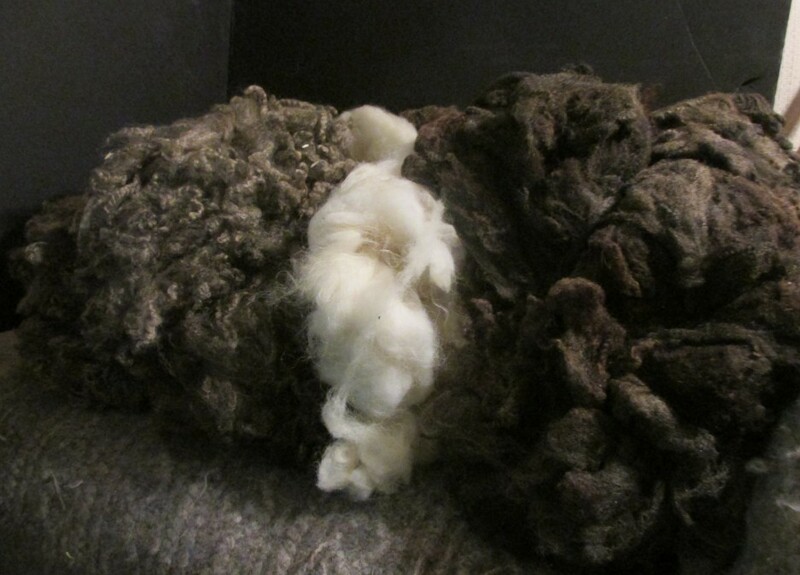 Weaver and spinner Andrea Myklebust grew a good crop of fax and drove it to Taproot Fiber Lab to have it processed. Flax grown in the United States! I am spinning it up into thread just now, a single about 8/1. Soon to be i the weft ofkitchen towels. The third source on which I rely on heavily is coming from Scandinavia. I buy mine at Vavstuga Weaving School in SHelburne Falls. It may also be available from other shops in the United States. It is pale and on the fine side, supple. My mainstay. I spin what is called wetspun thread. I keep a small water bowl handy near my left hand at the spinning wheel. The water binds the fibers a bit and nicely smooths down the surface of the thread. Some people swear by spittle, and spin their flax using only that. I prefer to use water! The other option is dry spun thread which is exactly as it sounds one spins the flax using dry fingers. The resulting thread is a bit hairy as a result. For certain applications this is a perfecty good choice. I am currently practicing to spin a finer thread this winter. By uing a distaff I find I can achieve more uniform and even thread, which is my goal. BY slowing down I am able to spin a bit finer with greater control. Aiming toward a consistently thinner thread I find I need to take more frequent breaks, so that I can do finger stretches with a rubber band and squeeze a ball of a sort of putty (given to me by my physical therapist) I soak my hands then in some hot water get a breath of fresh air and a sip of water and I am ready to continue.